We investigate the behaviour of a dynamic fluid–structure interaction model of a chorded polyurethane mitral valve prosthesis, focusing on the effects on valve dynamics of including descriptions of the bending stiffnesses of the valve leaflets and artificial chordae tendineae. Each of the chordae is attached at one end to the valve annulus and at the other to one of two chordal attachment points. These attachment points correspond to the positions where the chords of the real prosthesis would attach to the left-ventricular wall, although in the present study, these attachment points are kept fixed in space to facilitate comparison between our simulations and earlier results obtained from an experimental test rig. In our simulations, a time-dependent pressure difference derived from experimental measurements drives flow through the model valve during diastole and provides a realistic pressure load during systole. In previous modelling studies of this valve prosthesis, the valve presents an unrealistically large orifice at beginning of diastole and does not close completely at the end of diastole. 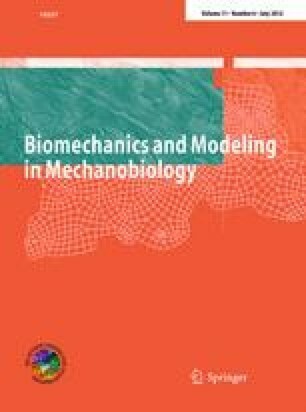 We show that including a description of the chordal bending stiffness enables the model valve to close properly at the end of the diastolic phase of the cardiac cycle. Valve over-opening is eliminated only by incorporating a description of the bending stiffnesses of the valve leaflets into the model. Thus, bending stiffness plays a significant role in the dynamic behaviour of the polyurethane mitral valve prosthesis.